Edco Supply Corporation, with over 60 years of experience, is the leading U.S. converter and supplier of military specification packaging. Edco is also a leading distributor of desiccants. We supply customers throughout the U.S., Canada, and worldwide. Our large inventory of government specification packaging allows us to ship orders in as few as 3 days, and often on the same day, guaranteeing prompt delivery. Our customer service team, averaging 10+ years of experience, provides fast and courteous service and will recommend just the right product to meet the specifications of your military contracts. With more than 35 one-of-a-kind converting machines, we can manufacture custom-sized barrier bags, tubing, shrouds, and blankets tailored to meet your needs at prices guaranteed to beat the competition. We provide a signed certificate of compliance with each military spec packaging order assuring you that our products meet the latest U.S. military requirements. Edco Supply Corporation also manufacturers and stocks a complete line of commercial packaging products. Thousands of companies throughout the US rely on Edco to supply them with packaging for their military contracts. Desiccant bags and packets are effective ways to control moisture exposure and prevent rust, mold, and mildew. VCI paper and film are treated with engineered chemicals that safely prevent corrosion on protected metals. Cushioning or protective packaging is a packaging process that involves several elements and materials. This protective layer prevents salt, dirt, oxygen and other materials from depositing on the metal and causing corrosion. These bags are specially designed to protect moisture sensitive items and devices from environmental damaging elements. 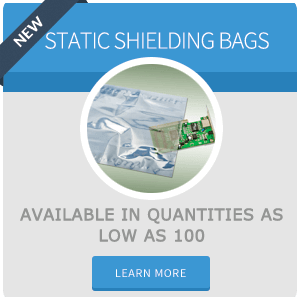 Our static shield bags are static safe and testable to industry standard. Bags can be printed with or without ESD warning symbol.